I've been as critical--if not more so--of the Michigan basketball team as anyone in the M blogosphere. I've written about this before, but my philosophy about basketball aligns pretty closely with that of the now defunct FreeDarko.com. One of the primary reasons for this tendency is because before approximately 2002, my interest in basketball could be pretty easily summarized: none. FreeDarko became a formative basketball tome for me, which means I favor highly athletic, fast, improvisational basketball, the likes of which John Beilein comprehensively squashes. There's been enough statistical analysis to support my favored brand of hoops, at least insofar as talent is concerned. In basketball, more than in any other sport, sheer talent level trumps just about everything. Sleepers, the likes of which you find a lot in football, don't really exist in any sustainable quantity in basketball. In fact, once you get to a pro level, they're basically non-existant (though Jeremy Lin is doing his best to disprove this idea). As such, the construction of the current Wolverine basketball squad is not really my style: a bunch of under the radar shooters that, frankly, are living up to their diminutive recruiting hype, and a few players with clear potential (Hardaway, Burke, Morris previously, etc). Beilein, however, is a mastermind. As most Michigan fans will tell you, Beilein is often cited as one of the best, if not the best, coach in college basketball. What he's been able to craft out of the motley collection of players Michigan runs out on any given night is nothing short of brilliance. Given the injuries that have plagued the team's depth for the last four years and the early defections of Manny Harris and Darius Morris, to be challenging for a Big Ten title this late in this season is a level of coaching that few of Beilein's contemporaries could even imagine. On Saturday, Michigan played a team that is objectively better than them at just about every position. And they've done that on a few occasions this season. Michigan is routinely outsized, out muscled, and out skilled. But somehow, the team keeps winning. This isn't a Tebow situation either, where the team is outplayed the whole game only to pull it out at the end. Michigan never trailed against Ohio State, one of the country's best teams, and a team that is, with Jared Sullinger, uniquely equipped to punish Michigan's greatest weakness. At one point during the second half, Sullinger went on a dominating streak of easy buckets in the paint. The Buckeyes ran down the floor, Sullinger got position on the block, and after an easy entry pass, Sullinger would quickly and easily finish at the basket. I Tweeted at the time that Michigan should change their defensive front to a zone defense in order to limit Sullinger's touches inside and force the Buckeyes to shoot more three pointers, the likes of which they struggled to hit the whole game. Beilein called a timeout with 8:46 left in the game and subsequently came out of the huddle in man defense again. I was displeased, but from that point on, Sullinger made only two free throws (earned after an offensive rebound) and a layup. He didn't even attempt another shot until the frantic final seconds of the game. Beilein nullified arguably the best player in the country during the final stretch of a tight game by.... I don't know, working on his players' footwork? Obviously the team didn't sell out on Sullinger, opening easier shots for the rest of the Buckeyes. So I don't know what was said, but the entire scenario was sublimely Beilein. With a team in serious foul trouble (Ohio State was in the bonus at the 12-minute mark of the second half) and a group of big men that would struggle to compete with Sullinger in any situation, Beilein stuck to his base defense and coached the team to a win. This is the epitome of a coach putting his team in the position to win. Those stepback jumpers by Stu Douglass and Zack Novak late in the game were beautiful. Terrifying, then beautiful. Trey Burke was the difference in this game. His 5/3 assist/turnover ratio is indicative of why Michigan won this game. He effectively nullified the defense of Aaron Craft by taking care of the ball and not giving the Buckeyes anything easy in transition. What a great game for Tim Hardaway Jr. to show up. 13 points on 4/5 shooting? Yes please. However, I could've sworn those back-to-back free throw misses were going to lose Michigan the game. They didn't, of course, and Hardaway turned in probably his best game of the year. Jordan Morgan was once again spectacular guarding Sullinger. He was great at fronting Sullinger and denying passes into the post. The one complaint about Morgan's defense in the game was allowing Sullinger to spin into the lane late in the game. Early on, Morgan was overplaying Sullinger to the inside, forcing him to spin baseline where help defense was coming. He stopped doing that during the aforementioned Sullinger run in the second half and I'm not sure why. Might've been a coaching decision. Michigan is going to need to run layup lines for the next month. This team missed a lot of easy looks at the basket. That's how you lose basketball games. To close the season, Michigan needs to win four games in which they'll be favored in order to have a shot at winning a Big Ten regular season title. It would be amazing if the team could get even a share of the title, but more importantly, it's clear that this team is set up to challenge for the title every year. 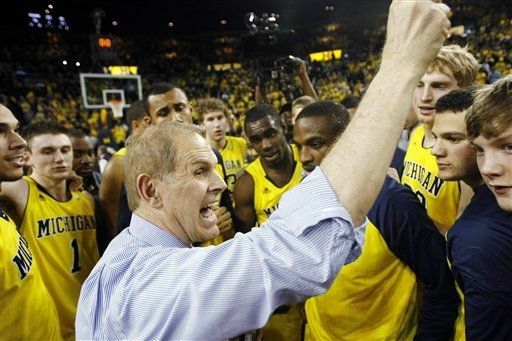 Beilein Uber Alles, amirite?